Missing two of your best players did not make much difference in the most recent Arizona Coyotes’ malady. After sustaining injuries in their last game, captain Shane Doan and defenseman Michael Stone did not dress for Monday night’s home game with Calgary, but even their lack of presence could not mask a poor effort. After matching the Philadelphia Flyers’ playoff-like intensity in their last game only two nights previously, the Coyotes seemed to skate in the sand and, when not skating in sand, were guilty standing still and out of position. The result was a disappointing, 5-2 defeat to the Calgary Flames before 14,347 in Gila River Arena. In trying to finish the season with good habits and encouraging steps for the future, the Coyotes seem to take a step back. Not only, in words of coach Dave Tippett, did the Coyotes have “no push,” there was not much else. The shot total, while not always a true indication of play, pretty much told the story. For the game, the Coyotes managed 24 shots on net, but just five shots in the opening 20 minutes of play. That reached near a season low. The Coyotes had only one shot on net in the third period on Feb. 13 at San Jose. Going forward, the issue of consistency remains paramount. Nearly at a loss or explanation, there was no reason and no judgment given for the slip Monday night. 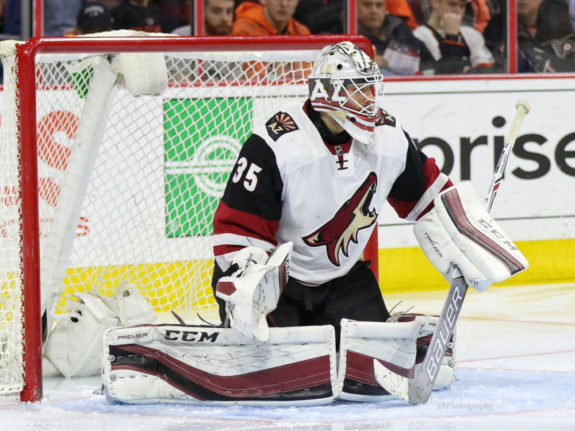 For some unexplained reason, the Coyotes miserably failed to match their strong level of play against the Flyers. Taking the blame for the malady, goalie Louis Domingue, who is splitting netminder duties with Mike Smith, did not dodge the bullet. At one point, the Coyotes held a 2-1 lead in this game, but surrendered power-play goals to Sean Monahan, late in the second period, and a tip-in in front by T. J. Brodie midway through the final period for the difference. While Duclair popped in his seventh and eighth power-play goals of the season, scoring with the man advantage is not a priority. From a coach’s perspective, Tippett said afterward, “we were not emotionally engaged.” To be fair, the Coyotes were without Doan and Stone, both of whom Tippett called “solid NHL players.” At the same time, Tippett promised this team will recover. If the Coyotes were sluggish, the Flames did not see things from that perspective. Coach Bob Hartley indicated Monahan’s goal with 29 seconds left in the second period, changed the outcome and became the most important goal of the game. That put the Flames ahead at 3-2 and represented the game-changer. From there, Calgary gained momentum but was aided by the Coyotes’ sloppy and uneven play. The loss was disappointing on several levels. First, the defeat prevented the Coyotes from sweeping their recently-completed four-game home stand. Plus, the loss was only the third in the Coyotes’ last nine games, and that represented their best set of contests of the season. With six games remaining and only one at home, Tippett hopes the Calgary game serves an important lesson. In the elusive quest for his team to play at a consistently high and competitive level, the overall effort simply needs to better.